In new Microsoft fashion I left it up to the community to decide what kind of article I would write next. A quick poll with options like how we build our type system or how to write a real-time game loop was put up. After a day, the results seem to be 15 of 27 votes for information on how the EdgeHTML Type System is built. You can view the set of questions and the full results here, http://www.strawpoll.me/4262678/r. 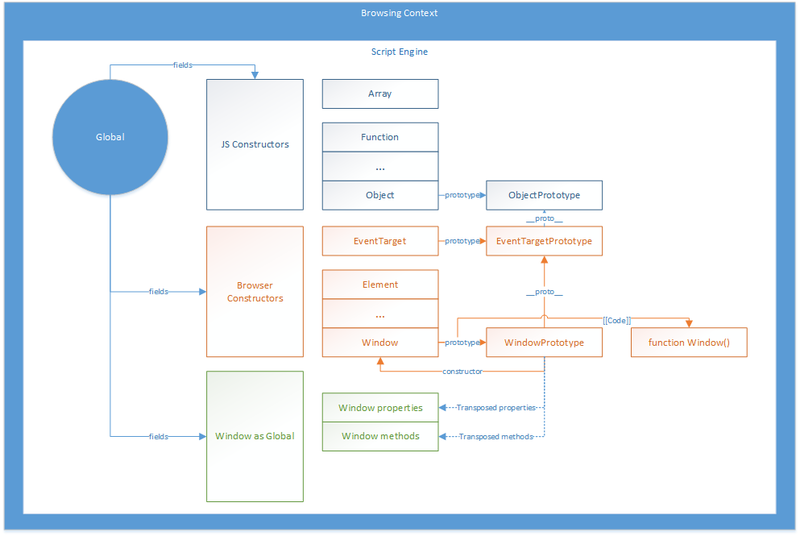 In IE 7 and older modes, IE was a purely COM extensible architecture. The binding from script to the DOM was all through this COM binding, specifically IDispatchEx. This was a complicated interface but its abstraction allowed for some very complicated scenarios. If IDispatchEx were the only binding method then this story might have unfolded differently. Perhaps with an IDispatchEx2 or similar, but it wasn't all there was, and in fact, most of IE was simply an IDispatchEx wrapper around real COM interfaces. COM interfaces favor static binding over dynamic binding and thus most of our DOM was statically, tightly bound to legacy while we wanted to move forward, progressively improving. Something had to give. Well, IE 8 would not be the release for dramatic improvement on this front. with over 3000 APIs already bound to COM, some sort of stop gap needed to be inserted. It would come in the form of Document Modes and those in turn would drive OM Versions. With 8 we introduced a compatibility mode and an IE 8 mode and with some tricks played on top of IDispatchEx, we could get any script callers who did dynamic binding to dynamically bind to the an alternate version of the interface based on their document mode. This seemed fairly clever at the time and in fact, any system with two versions scales pretty well. The fault would come when we started adding more modes. The trick was simple, have the script engine know its OM Version and have it pass this information when querying for the interface mapping. You could even get clever and have the same document pretend to be 8 and compat at the same time, since the caller was in charge of noting their version. This also allowed for some clever scenarios. We would eventually rip this out in favor of version locking and callee based versioning in IE 9, but this in turn caused a slightly different set of problems. But what about prototypes? Well, IE 8 was released with MDP or Mutable DOM Prototypes. I can find almost no public information about it, but it is out there, and we did write MSDN documentation for it. It allowed you to use some of the later ES 5 methods like defineProperty to reconfigure IE. This was quite a bit of work, was built on top of IDispatchEx, and obeyed all of the OM versioning logic. For the first time, IE would push constructors into the window global type system, allow you to add your own property getters/setters/methods, and those objects would be included in name resolution when script was trying to figure out what to execute on a given instance. We built a minimal inheritance support (so you could derive types), we allowed wrapping of our own native methods so you could do composition, the delete operator started working more reliably. If it weren't completely bolted on to a legacy system whose performance was suffering, with early versions of Chrome demonstrating much faster script execution, it might have stuck. But it couldn't stick. With slow DOM performance compared to other browsers IE needed an overhaul. We also began to find that not all of the features in ES 5 were going to be possible to implement. And the final straw was the versioning semantics that we had been employing. As we added more and more COM interfaces to provide versioned characteristics of the same API (some APIs have 4 different implementations) the composition problem started to get really bad. COM could undercut your API replacement. If you wanted to log all calls to setAttribute, for instance, there were some callers that could avoid you by going through older internal methods without being redirected properly. I apologize for all of the history, take a short breather, and we'll move into the modern and stop talking about COM. Don't get me wrong, this transformation doesn't happen over night. We had, at the time, over 3400 properties and methods to convert. So there were a lot of "go to the COM" redirection bindings. For critical APIs though, we removed this redirection and made super lightweight bindings instead. I'll get more into the details of this a bit later. So FastDOM was first and foremost a compiler. It took in a modified version of webIDL which describes the prototype hierarchy, methods, properties, constants and any specialized configurations (read-only, not enumerable, etc..., stuff you can do on defineProperty). From there it builds out the code for configuring a full type system of constructors and prototypes. Finally it sets up the engine so that it can then bind instances to the rest of the type system. This is already getting deep, so if you are unfamiliar with some of the concepts, look at Figure 1. It details how all of these objects interact with one another and thus helps to explain the glue code that we have to create to combine them. The constructors all become fields, based on their name, on the Global object itself. This had already been there in IE 8 with MDP in the same way. When interrogating the window.HTMLElement, there was something there. A Function object, whose prototype in turn pointed to the HTMLElementPrototype. And that in turn was referred to by any HTMLElement instances to discover its methods and properties. Figure 2: Methods, Properties and Constants, Oh My!!! There is a lot of ground to cover and I'm open to using questions as a way to guide progress. So let me know what you think. Its probably easiest to grab me on Twitter and the resulting Tweetfests should be fun for others as well, @JustrogDigiTec.